Taking place at the iconic Rose Bowl, the Masters of Taste places delectable small bites to the forefront. Starting at 3PM, all bets are off. Attendees stormed the field for the best day in the culinary space. From local breweries, wineries, to family owned restaurants serving generational favorites there is something for everyone and infamous combinations that await! Masters of Taste brought together over 50 local favorites and even included a sit-down Wolfgang Puck Experience and cocktail bar at the 50-yard line! Once again, the premiere food and beverage festival donates 100% of the proceeds to the Union Station Homeless Services. 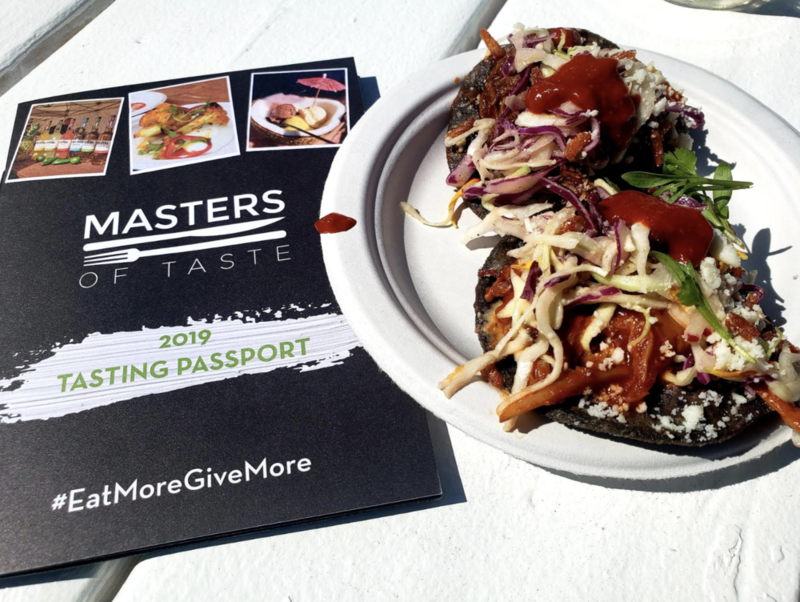 Over the last three years Masters of Taste has raised over $1.5 Million in support of Union Station’s life-saving programs and that is what truly sets Masters of Taste apart from its competitors. Cento Pasta bar had a line worth waiting for and truly delivered on their dish of choice. A fresh bowl of gnocchi with spicy sausage topped with parmesan cheese -- simply everything! When asked their reason for opting for joining in on the Mastes of Taste, Chef Florent Courriol of Alexander’s Steakhouse simply said, "why not!" Alexander's Steakhouse served a wagyu shot comprised of: A5 wagyu tataki, sudachi jelly, serrano chile, sake kasu, seaweed cracker with bubu arare - simply irresistible. Chef Hiro Fujita of 1212 Santa Monica showcased a fresh cauliflower Caesar with grana padano cheese. "People are lining up for seconds," stated a representative of 1212 Santa Monica -- a tall tell sign of cravable servings. Pez Cantina's Chef Bret Thompson served a fillable farm chicken green chile broth pozole Verde with potato and broccoli taquito topped with roasted poblano crema - a perfect mix! Although the fest shines more light on the culinary aspect, there were some fine desserts in tow this year. Lark Cake Shop, Lady M., and of course Porto’s Bakery,were just a few of the many sweets that were on site. Lark Cake Shop served up the perfect size of carrot mini-cupcakes and triple chocolate cream cupcakes to combat the heat and were sold out within 2.5 hours of opening. Supercool Creamery drew in crowds by its dramatic demonstration of nitro artisan handmade ice cream. From "Kale Ale," to "Bitter Stouts," the unique creations did not stop at the food. The Masters of Taste showcased a few interesting cocktails, wines, and brews from some notable sites such as: Indie Brewing Company, Iron triangle Brewing, Los Angeles Ale Works, MacLeod Ale Brewing Co. Even Arcadia’s first Microbrewery Mt. Lowe Brewing Co., joined in on the festivities. A specially curated collection of Wine Masters will be showcasing their finest varietals including premium boutique winery Ascension Cellars,CRŪ Winery, Frisco Cellars, Golden Star Vineyards & Winery, Hitching Post Winery, Kieu Hoang Winery, Anderson Valley’s Navarro Vineyards, San Simeon Wines, Vinemark Cellars, Wrath Wines and more. Each year the field with L.A's top bartenders creating refreshing first-rate craft cocktails. This year Cameron Masden of The Raymond 1886 created a delicious gin cocktail, with a twist. Ned Kirby of Magnolia House, and Katie Putterlik of Otoño were also on deck. This is the 4th year for the foodie paradise fest, this year alone drew in a crowd of 2,500 attendees, and there is no signs of slowing down! Each year has proven to be bigger and better and next year is surely to follow suit. Saddle up and prepare for a culinary paradise event that highlights intriguing fare delivered from notable talent across the city. Prepare for an event that is actually worth every minute of the hype.